Activity policies allow you to enforce a wide range of automated processes using the app provider’s APIs. These policies enable you to monitor specific activities carried out by various users, or follow unexpectedly high rates of one certain type of activity. 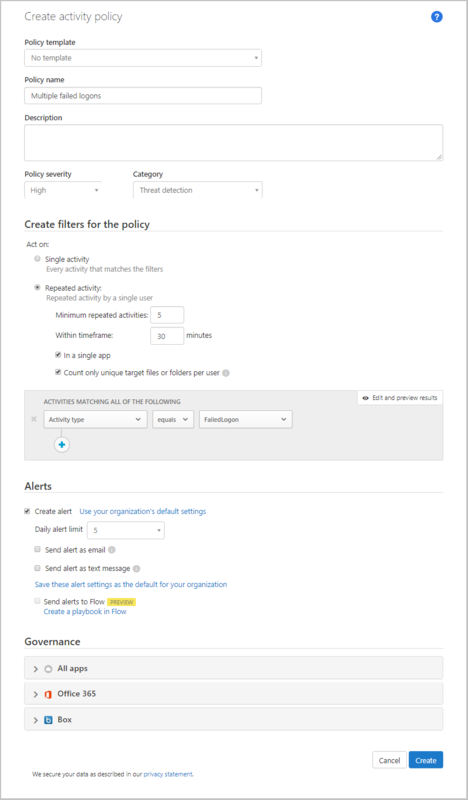 After you set an activity detection policy, it starts to generate alerts - alerts are only generated on activities that occur after you create the policy. You can set activity alerts to be sent to yourself or to the user when these events occur. You can even suspend the user until you have finished investigating what happened. In the console, click on Control followed by Policies. Click Create policy and select Activity policy. Give your policy a name and description, if you want you can base it on a template, for more information on policy templates, see Control cloud apps with policies. To set which actions or other metrics will trigger this policy, work with the Activity filters. Under Activity match parameters, select when a policy violation will be triggered. Choose to trigger when a single activity matches the filters or only when a specified number of Repeated activities are detected. If you choose Repeated activity, you can set In a single app. This setting will trigger a policy match only when the repeated activities occur in the same app. For example, five downloads in 30 minutes from Box trigger a policy match. Configure the Actions that should be taken when a match is found. You can set policy so that you receive an alert when a large number of failed logins within a short time period occurs. 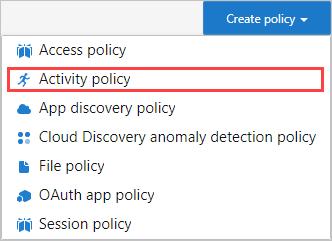 To configure this sort of policy, choose the appropriate activity filter in the New Activity Policy page. 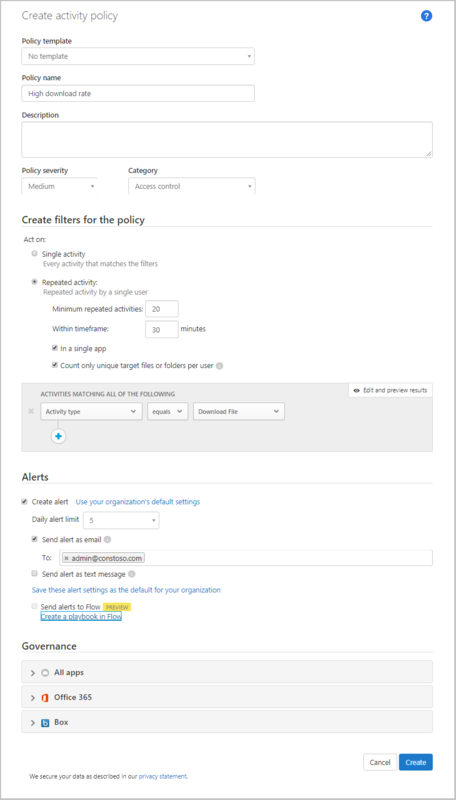 Beneath the Activity filters field, configure the parameters for which the alert will be triggered. You can set your policy so that you receive an alert when there has been an unexpected or uncharacteristic level of downloading activity. To configure this sort of policy, under Rate parameters, choose the parameters to trigger the alert. This section has reference details about policies, explanations for each policy type, and the fields that can be configured for each policy. Activity filters – Enable you to create granular conditions based on metadata. Activity match parameters – Enable you to set a threshold for the number of times an activity repeats to be considered to match the policy. Specify the number of repeated activities required to match the policy. For example, set a policy to alert when a user has 10 unsuccessful login attempts in a 2-minute time frame. By default, **Activity match parameter raises a match for every single activity that meets all of the activity filters. Using Repeated activity you can set the number of repeated activities, the duration of the time frame in which the activities are counted. You can also specify that all activities should be performed by the same user and in the same cloud app. Actions – The policy provides a set of governance actions that can be automatically applied when violations are detected.